I wrote a whole intro for this post, but then I scrapped it and decided to just get right into it :-). If you do a search for “psd to html” you’ll see a ton of Google ads. They’re all pretty much the same though. They’re very dry, promise cheap prices and 2-second turnaround times. But you might relate to this: our company is about quality first, so we’re slower, and we’re a bit more expensive too. At first glance, those things seem like they give our competitors an edge, but I feel differently. So I put all that in an ad. In essence, I said we’re not cheap, but we’re good. So next time you’re worried about competing based on price and ETA, don’t. There are lots of people out there who will pay more for a good product. Don’t be afraid to raise your hand and let them know that’s who you are. Lots of clients will pay more for a good product. Raise your hand and show them who you are. Find your strengths, even if others might perceive them as weaknesses, and figure out how to communicate them in your advertising. As a responsive design / development company, it was kind of embarrassing that it took us this long. But, we’ve been so busy helping others that we didn’t have the time to help ourselves, or at least that’s what I kept telling myself. We were getting a couple thousand visits a month from smart phones, and 90% of them were instantly hitting the back button on our page! Ahhh! The worst part: we were PAYING for most of that traffic too. Talk about money down the drain. As soon as we made our site responsive, our mobile bounce rate plummeted to around 40-70% depending on the traffic source (not all traffic is equal). And we noticed a bump in inquiries / contact form submissions too. That meant it was pretty much on par with our desktop stats, which have always been pretty solid. So if your portfolio doesn’t provide a great experience for phones / tablets, get on it ASAP! If you’re not tracking your site with analytics (like Google Analtyics, which is what we use on top of some other things), you could be blowing your chances at potential clients too. Analytics will tell you where your clients come from, which ads are working, which aren’t, and more. It’s basically a “cheat sheet” for where you should put your time and effort. And we added a “popup form” to try to get more subscribers too. I talked about this at length in a couple posts on email marketing recently. Basically, we did more of exactly what I wrote in those posts. As a result, we got more clients. Something cool: Google Analytics will actually tell you how many days are between when someone first came to your site, and when they completed a “goal” or “event” (such as filling out a contact form). This is especially awesome because it showed me which of our emails are really converting. For example: we have a 5-part auto-responder series when people opt in for our “10% off” discount. It’s 1 email per week for 5 weeks. Very non-intrusive, and each email has good stuff to say that adds value to people’s lives (that’s the golden rule of email marketing). The golden rule of email marketing: add value to people’s lives. I noticed through analytics that a lot of people were filling out our quote form 21 days after first visiting our site. 21 days is 3 weeks, so I realized that email 3 was really a winner for us. I also noticed some of these “delays” that were at odd times, like 13 days, or 16. I attributed that to the occasional “blast” we send out when we have good news or a good tip to share. Using this info, I can further adjust and tweak our entire autoresponder series / email marketing efforts to optimize it even more. 1) Make it EASY to exit out of. Otherwise, people feel trapped, and they get angry (don’t you just hate it when you’re “trapped” with a popup?). 2) Make the offer GOOD. (Talked about this at length in those articles on email marketing too). 4. Hired an amazing project manager. Millo’s own April Greer has been helping our team out for the past month, and it has worked wonders. She gives us a few hours a day before she dives into her awesome freelance biz and Millo content management. 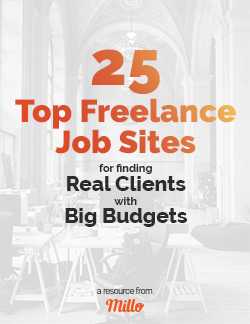 If your freelance / agency career has just begun, you might not have to worry about this for a while, but if you’re past the point (or at it) where you need help – finding the right person seriously makes all the difference. Our team of developers has been steadily growing, but this is the first time we’ve trusted another person with customer service and project management. We’re SUPER picky about this sort of thing, so we’ve had a lot of trouble letting go. But we knew we needed to do this because my partner, who handled 100% of these tasks before, was about ready to pull her hair out from being overloaded. Since we found someone we can trust though, we’ve been able to let go of some of these tasks and instead focus on more big picture things to push our company along as a whole. It’s no coincidence that in April’s first month with us (coincidentally, it was the month of April) we’ve had our best month yet. And we’re already on pace to leave last month in the dust. What have you done recently to grow your business? Let me know in the comments. Would love to hear your thoughts. I zeroed in on your first point and the mention you made of an ad that generated customer comments. Would you be able to share that ad with us as a learning point/example of what worked for you? I also appreciated the whole post for its meaty-ness (a real word?). Useful! Thank you. Thanks for skipping the intro and getting to the point of the article. Another way to keep readers? I like it. Great information and definitely things I will take into consideration. I also take a bit longer than others on jobs, but like you, emphasize quality over speed, which can actually reduce the amount of time a client has to look for someone else to fix the issues the first speedy company created. i work full-time remotely for a company but also freelance on the side. I don’t have a website (I know, I know), but I don’t have time to build it myself and it’s not my specialty so it would take me forever to get it done the way I want it. But I know I need one if I want to increase my freelance work enough to one day go full-time with it. Thanks for the advice! I understand your dilemma. I think you either have to turn to someone you trust to help you with the website, or find another way to market yourself. If you have a solid portfolio and good communication skills, that’s more than enough to reach out to potential clients and get the ball rolling. Great post Dave ! Funny how we tend to do our own stuff last! I can so relate to that. You inspired me to get on with it! Awesome advice Dave. I will definitely incorporate the email marketing strategy with our new site. Now to get on with it. 100%. We had our web design agency about 6 months before we even had a website for it lol… Too true. Glad to hear it!! Get S**t Done!! Hi David, great post! In a nutshell it is utterly important to provide value and to offer great quality of service and products. For a fact, I know a lot of people who learned it the hard way and are no longer searching for “some agency” but for “the agency” that can deliver high quality service respecting the deadlines, and they don’t mind paying more for it. Thanks for sharing your changes, it’s always helpful learning what other agencies do to improve, especially as our business is still pretty new!